39 Indians Dead In Iraq: In Rajya Sabha, Sushma Swaraj said it was confirmed yesterday that DNA of 38 had matched remains found underneath a mound. Last year, Sushma Swaraj had met the family members of the Indians kidnapped by ISIS in Iraq. The 39 Indians missing in Iraq since they were kidnapped by the terror outfit ISIS four years ago have been confirmed dead after their bodies were found, Foreign Minister Sushma Swaraj said in parliament today. "With full proof I can say these 39 are dead. We wanted to give the families closure only after concrete proof," she said. Opposition allegations exploded after the revelation; the Congress accused the government of giving the Indians' families false hope and misleading the nation. Last year, Sushma Swaraj had told parliament that until evidence suggested otherwise, the workers would be presumed alive. The minister said in the Rajya Sabha it was confirmed yesterday that the DNA of 38 had matched remains found underneath a mound, one of many in and around Mosul and Badush after their liberation from ISIS. One body was a 70 per cent match. A moment's silence was observed in the Rajya Sabha after Sushma Swaraj's statement. "We used a deep penetration satellite... It had exactly 39 bodies with distinctive features like long hair, Sikh kadas (bangles) non-Iraqi shoes and IDs," Ms Swaraj said. "It was a most difficult task to get the proof. It was a pile of bodies. To track down the bodies of our people and to take them to Baghdad for DNA tests was a huge task," she informed, commending her junior, Minister of State VK Singh, for supervising the challenging job. Congress lawmaker Ghulam Nabi Azad reminded Ms Swaraj that she had "assured us last year that the Indians were alive". "We never misled anyone. We said unless we have evidence, we cannot declare them dead," said Mr Singh. The Indian construction workers, who were from Punjab, Bihar, Himachal Pradesh and Bengal, were taken hostage when the ISIS invaded Mosul, Iraq's second largest city, in 2014. The workers were trying to leave Mosul when they were caught. One of them, Harjit Masih from Punjab's Gurdaspur, managed to escape after posing as a Muslim. Last year, Ms Swaraj had told the families of the workers that an Iraqi official had told Mr Singh the Indians were made to work at a hospital construction site and then shifted to a farm before they were thrown into a jail in Badush. Harjit Masih, the escaped Indian, claimed that he saw his compatriots executed but the government rejected it. "For four years, the minister had told me that they were alive, I don't know what to believe anymore," said Gurpinder Kaur, sister of Manjinder Singh, one of the men killed in Iraq. 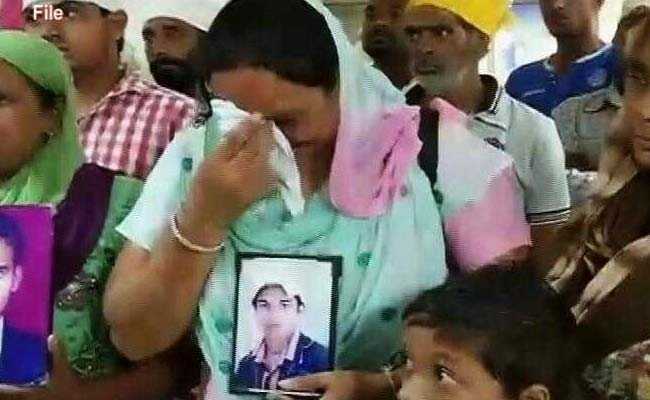 Ms Kaur questioned why the minister didn't inform the families before making her statement in parliament. Ms Swaraj told reporters: "I was duty-bound to inform parliament first." More than 10,000 Indians fled Iraq at the height of ISIS violence in 2014. These included nurses held captive by the ISIS in Tikrit and Mosul before being allowed to return home.